Vital Imagery Blog: What Image Style Best Convey's a Cat's Mystique? I'm not a cat person. And when it comes to illustrations my eye doesn't typically favour a silhouette. There are, however, many people who love the former and times when your project quite simply would be more greatly enhanced by the simplistic, times when a silhouette is the only right choice. 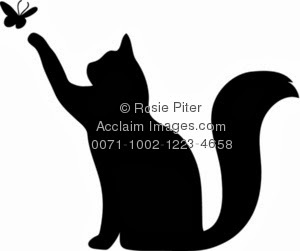 It was just the other day that I happened on this image of a cat reaching for a butterfly and in an instant found it absolutely charming. Given my ambivalence to both subject and style, this came as a surprise. But, it dawned on me then, that when it comes to the graceful feline, a monochromatic illustration lends itself well to the animal's mystique. Probably with no other subject does a silhouette convey as much charisma. And there's no mistaking this is a very cute illustration to boot. I decided therefore to do a little pussyfooting (so, sorry) around the net and see what kind of cat silhouettes I could find. Some of the illustrations had keyword issues that brought a few non-silhouettes into the mix, but below are the results. Some great images for sure.